Grading papers and all the other business of ending a semester temporarily halted my writing, but expect some Christmas items over the next week. On December 18, 1906, Lathrop’s Pet Stock Shop in Rochester, New York, mailed this postcard to a local customer. The message on the back offered “the best appreciated Holiday gifts,” including “Canary Birds of all varieties,” other song birds, gold fish, parrots, dogs, cats, and squirrels. The shop also carried “Medicines for every known pet” and offered free advice to pet owners, who for the most part did their own doctoring. Here’s a detail of the central part of the image. On the left, fish bowls are stacked all the way to the ceiling, while aquarium ornaments crowd the shelves below. 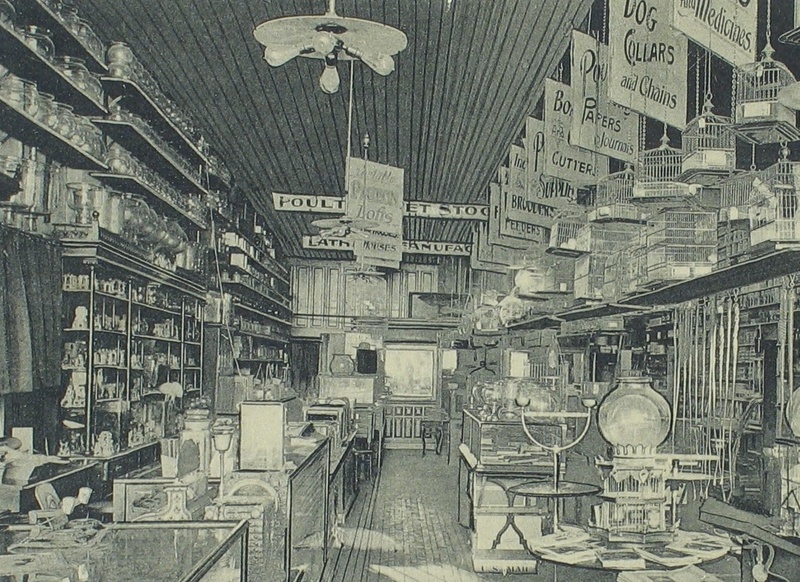 Lathrop’s promised its customers the “Largest assortment of Bird Cages,” and you can see them in the picture, hanging from the ceiling and perched on an improvised shelf on the right side of the long, narrow shop. On the right, an “illusion cage” sits on a round table. These had been available since the late eighteenth century. A double walled fish globe surmounts a bird cage. A perch extends up into the globe, so that the bird will appear to be singing underwater, while fish swim around it. This was not a great environment for a goldfish; I can’t imagine that they survived very long in the narrow confines of the double-walled globe. By the early 1900s, goldfish were cheap enough that they could be given as inexpensive gifts, and they were, as they are now, disposable pets. To the right of the “illusion cage” hang dog leashes, and the small boxes behind may be the dog medicines sold by the shop. To the left of the illusion cage is a large parrot stand with two cups for food and water. Notice too that the store offers supplies for urban chickens and for pigeons. Where are the animals? Probably in the back of the store, away from the drafts from the the front door. Or perhaps they were upstairs. This was the time of year when fresh shipments of canaries arrived in pet stores, many shipped all the way from Germany. 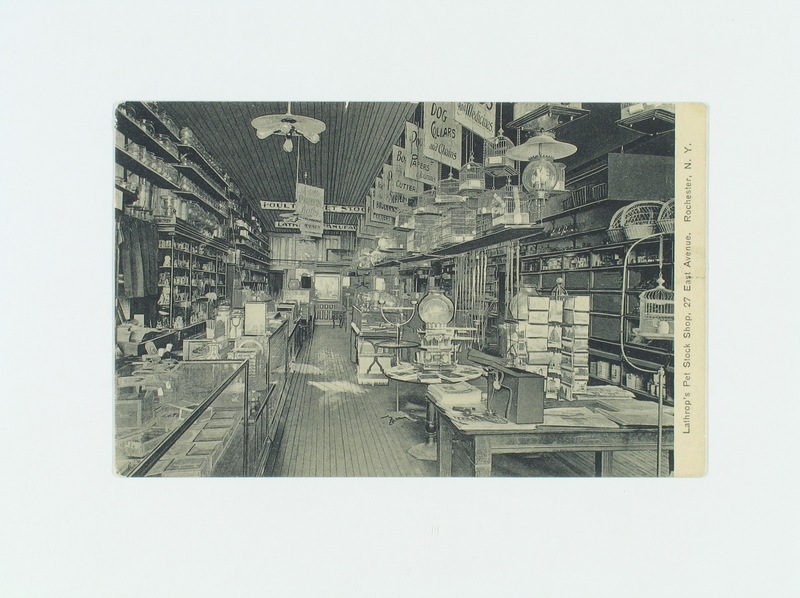 Notice that Lathrop’s, which sat in the heart of the downtown on prestigious East Avenue, also earned money by using the space right inside the door to sell magazines, newspapers, postcards and cigars, all of which are visible in the full card. But the fact that the animals themselves are invisible suggest one of the fundamental truths of the pet supplies business: buying the animal is just the first step in a long series of purchases of equipment, supplies and services. These are what Lathrop’s highlighted inside the entrance to the store.